Everyone needs a reliable little backpack in their lives. They are just a great investment. 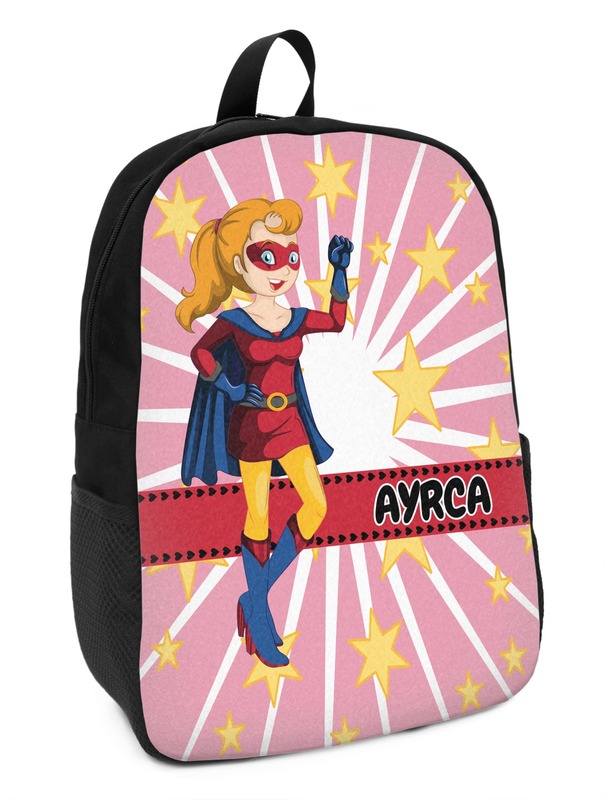 Now you can personalize the front of this backpack to make others go "wow"! These small backpacks are made of a durable black canvas material with your personalization right on the front. The two shoulder straps are padded and easily adjustable. The bag itself measures at about 11" W x 15" H x 5" D. It's the perfect size for elementary aged kids or adults who want a smaller backpack. On the top of the bag you will find a handle to hang or carry your backpack by as well as a large zipper closure to keep all of your belongings safe inside. On each side of your backpack is a mesh pocket for a small item or water bottle. Inside your backpack you will find a spacious area with a small zipper pocket and a padded laptop slot that will fit up to a 13" laptop (13" being very snug). This is the perfect bag for any student that needs a couple books and their laptop with them at all times. It also works great as a carry on for traveling! Jump into our design center to get started designing your backpack. Grab a fun pattern, color, font, and more. If you have any questions just give us a ring! We are always happy to help. Now get everything you might need to put inside your backpack! If it's for the kids going back to school, take a look at our Office and Desk Accessories where you'll find spiral notebooks, binders, clipboards, laptop sleeves, and more. But maybe this backpack is for travel. Be sure to check out our Travel Accessories section as well where you'll find everything from luggage tags to travel dopp kits.